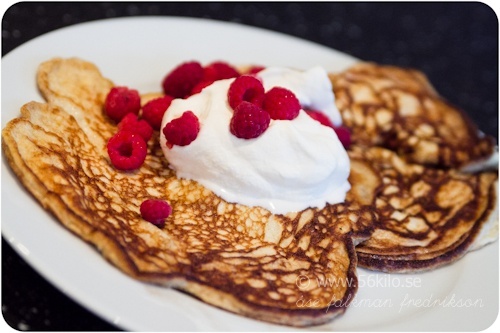 These pancakes are traditionally served with lingonberries or lingonberry preserves, as a dessert following Thursday Pea Soup. Swedish cooks use a special cast-iron pan called a plättpanna, which has seven shallow depressions, three inches in diameter. You can find these pans in Scandinavian gift shops and gourmet cookware stores. Otherwise, use an ordinary griddle and make either large or small pancakes. Combine the flour, sugar, and salt in a mixing bowl. Stir in the milk, cream, eggs and melted butter and blend until smooth. Brush the griddle with butter and place it over medium-high heat. To form each pancake, drop one large spoon of batter onto the griddle. After 1-2 minutes, when the edges begin to brown, turn each pancake over with a narrow spatula and cook for another 1-2 minutes, or until golden brown. Serve immediately with sour cream and preserves. Note: Batter can be made the night before and stored in the refrigerator until ready to prepare.